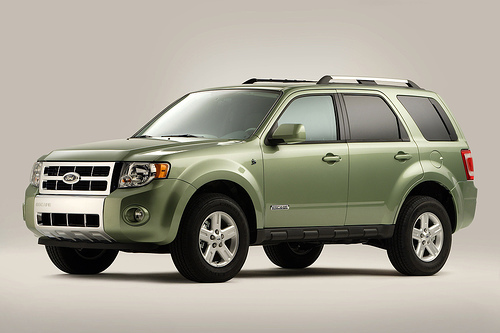 Photo of the Ford Escape Hybrid, which Ford CEO Alan Mulally drove to DC from Detroit, by Ford Motor Company from Flickr. Yesterday, the “Big Three” U.S. automakers — General Motors Corp., Ford Motor Co. and Chrysler — got a second chance at asking Congress for a bailout after their initial attempt got shot down last month. Auto expert Jim Motavalli, blogger for the New York Times and The Daily Green, insists that the bailout should include a “green makeover,” according to his recent analysis for Yale Environment 360. Treehugger nicely sums up Motavalli’s main arguments. Readers chimed in with additional comments and recommendations, with some people suggesting that the free market should just let the Big Three die and allow room for innovative, environmentally responsible companies to take over. In a eco-friendly and (perhasps) symbolic gesture, Ford CEO Alan Mullally chose to drive a Ford Escape Hybrid for his road trip to Washington, and General Motors CEO Rick Wagoner arrived in a Chevrolet Malibu Hybrid Sedan. (Here’s a comparison of the two cars from Conde Nast Portfolio. Apparently, Mullally had the sweeter ride.) This week’s mode of transport contrasted sharply with their previous trip to Capitol Hill via luxurious corporate jets. GM, like Ford, has stressed a plan (read the PDF here) to move towards more fuel-efficient vehicles, requesting as much as $18 billion in federal loans over the next year. Chrysler is requesting a $7 billion “bridge loan” by the end of the year. (Read the official plan at AutoBlog.) In a section titled, “Providing Cars and Trucks People Want to Buy,” the company states it will launch 24 major products through 2012, including various types of hybrid electric-drive vehicles. It will introduce the first full function electric-drive car in 2010. Also, the company says it is “on target” for 50% of its fleet will be flex fuel capable by 2012. While it’s encouraging to see that Detroit is finally getting on board the green bandwagon, it’s important to note that fuel efficiency cannot be viewed as a cure-all solution to environmental and transportation problems. Read a press release about his analysis here. So no matter what happens with the Big Three, car companies around the world will need to start thinking about making their vehicles smaller and reducing miles traveled, which will require the cooperation of governments, communities and corporations. This bailout is just the beginning of the solution. Cash for Clunkers: "Environmental Effects Will Be Negligible"
Tags: Hybrids, United States, Washington, D.C.